The Fractional Laser Erbium 1550nm Non-ablative skin resurfacing is the treatment of choice for those who would like to achieve improvement in the appearance of their skin. This procedure successfully reduces superficial lines to moderately deep wrinkles. 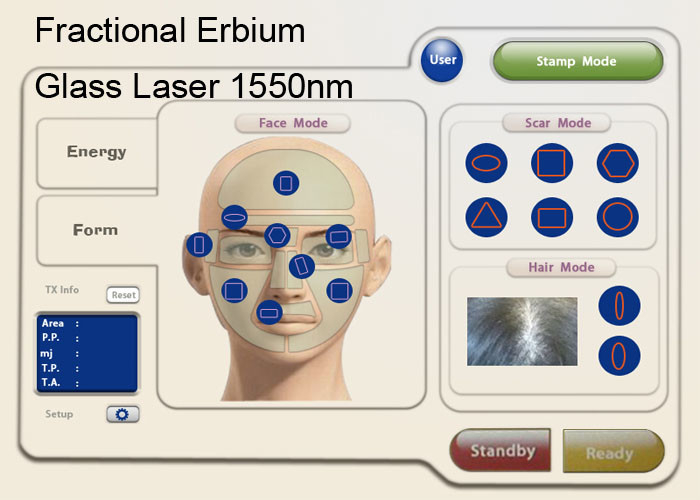 Fractional Erbium Glass Laser 1550nm is gentler than traditional resurfacing lasers , it is non-ablative fractional laser which has been effectively used in skin rejuvenation. This laser treatment can soften fine lines, wrinkles, reduce open pores, even out acne and scars, skin pigmentation associated with photo damaging, improve stretch marks. Fractional Erbium Glass Laser 1550nm delivers a laser beam divided into thousands of tiny ”micro thermal” zones that target a fraction of the skin at a time. Skin repairs by pushing out the old damaged skin and replacing it with new skin. It triggers the body’s natural healing process inducing new collagen and elastin regeneration, which results in tighter, fresher and more younger looking from inside-out. The target tissue is water, no skin type limit (Fitzpatrick I-VI). Less thermal ablation and deeper penetration, less side effects. Random scanning avoids thermal damage caused by heat accumulation, reducing the pain of the treatment. Skin appears pink or red after the procedure, but more rapid recovery compared with traditional resurfacing laser platform. What Is This Laser Treatment Used To Treat? ● You may experience a mild sunburn sensation for about an hour after the procedure. ● Swelling is usually minimal and should resolve in 2-3 days. ● The skin will have a pinkish tone for 2-3 days. ● Drink plenty of water to stay hydrated. ● Sunscreen at least SPF 30+ is a must. Wear protective clothing and wide-brimmed hat to protect the skin form sun exposure.